While public ice skating is available year-round, there is something about the approach of winter that makes it even more exciting to slip into your skates. From well-established arenas to outdoor rinks, Nebraska is home to several great places to hit the ice with friends and family. So lace up your skates—here are the 10 best ice skating rinks in Nebraska. The Moylan Iceplex in Omaha, Nebraska boasts an NHL-sized sheet of ice as well as the only Olympic-sized rink in the state. Although it is home to the Omaha Hockey Club and the Omaha AAA, the rink offers 1,500+ hours of public skating time. This the perfect place to have fun on an impressive rink at a very reasonable price. 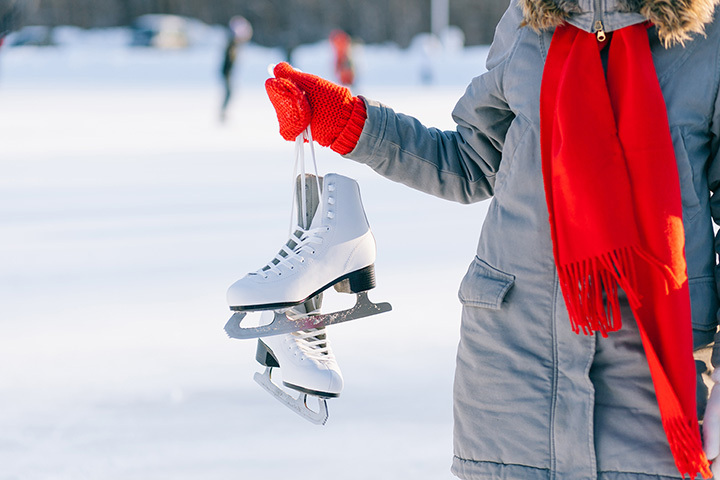 Dust off your skates and hit The Sidner Ice Arena in Fremont, Nebraska for some family fun. Public skate sessions, events, and hockey games can all be found at this popular rink. One of the best ice skating rinks in Omaha, Nebraska, the Motto McLean Ice Arena is open year-round and hosts ice skating sessions for all ages. The arena also features figure and ice skating lessons, so there’s no excuse not to get on the ice and have some fun! This brand-new ice rink in Omaha, Nebraska is home to the Omaha Broomball Club, league hockey clubs, and open skate sessions where anyone can come have some fun on the ice. With a full-service food and beverage bar and fully-furnished party rooms, Grover Ice is the perfect winter getaway. The large, well-manicured ice rink at Mahoney State Park is open until Mid-March and even allows ice skating during off-hours if you bring your own skates. During operating hours, the admission fee is very reasonable, and with the nearby indoor activities center, a visit to the park is the perfect afternoon outing for families with kids. Need a fun way to burn off those extra holiday calories? The University of Nebraska Medical Center sets up an outdoor ice skating rink every year with public skating on Fridays and Saturdays. It also features concessions, music, and seasonal decorations. The Railyard Ice Rink located in the popular Public Market in Lincoln, Nebraska has quickly become a special wintertime tradition. The beautiful outdoor ice skating rink is surrounded by shops and restaurants where you can enjoy a hot beverage after hitting the ice. This large event center in Kearney, Nebraska is also home to public ice skating sessions during the winter months. All ages are welcome and skate rental is available at the rink. The University of Nebraska-Lincoln’s first indoor rink also opens its NHL-sized sheet of ice to the public throughout the year. If you’re looking to spend the afternoon leisure-skating or if you’re interested in ice sports, the center provides a wide array of options. The Ralston Arena offers public skating to anyone who wants to experience a good time. Be sure to check the website for dates and enjoy a fun time on the ice right outside of Omaha. View more Nebraska Ice Skating Rinks.